Milan was born and raised in Tennessee and started shooting before he could walk. He would sit in his fathers lap and fire a Marlin 22lr rifle. Joining the Tennessee Army National Guard at age 17 was a perfect fit for the young energetic teen. While attending electronics school at Fort Huachuca on active duty, he developed a love of the desert. In 1997 an opportunity was presented which would bring him back to Arizona where he still resides today. While working with schools on a daily basis, he identified a need at all levels to provide needed training. Samantha has been a shooter all her life. 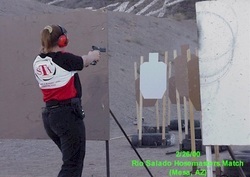 While growing up in Tennessee she had ample opportunity to hone her marksmanship skills and has spent many days at the range with her parents at IHMSA Silhouette matches as well as USPSA Practical Pistol matches. Samantha started competing with the Cactus Match League at the age of 12 with a single stack Colt 45ACP and quickly advanced to a double stack 40 cal STI EDGE. Married with 2 young sons, Samantha has recently rejoined the shooting community.